A few fresh and simple ingredients make this the perfect light summer meal! Ready in less than 10 minutes. Tuna is one of the easiest fish to grill because it almost never sticks if your grill rack is squeaky clean; spray your grill rack with oil before cooking for perfect results every time. Place arugula and capers on a plate. Combine oil and lemon juice, salt and pepper. Heat your grill to high heat and clean grate well. When grill is hot, spray grate with oil to prevent sticking then place tuna on the grill; cook one minute without moving. Turn over and cook an additional minute; remove from heat and set aside on a plate. 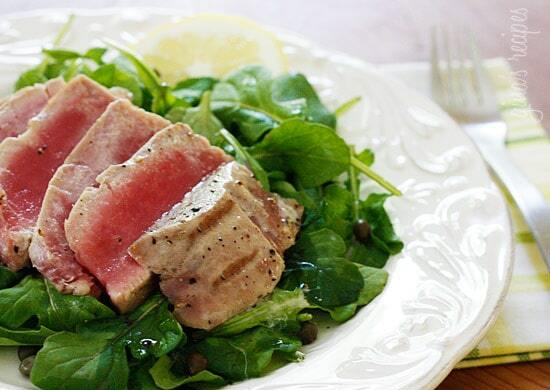 Slice tuna on the diagonal and place on top of salad. 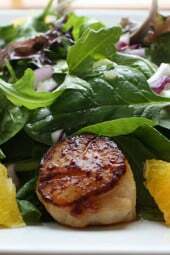 Top with lemon vinaigrette and eat immediately. We don’t currently have a grill. Could I just sear on stovetop ? I made this tonight for dinner and It was soooo good. Light, fresh and it looked so good on the plate. 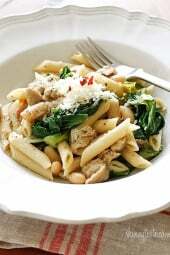 Added some shaved Parmesan and it matched perfectly with the rest of the flavours. Thanks for sharing! Gina- Do you know the WW points for just the tuna without the salad? 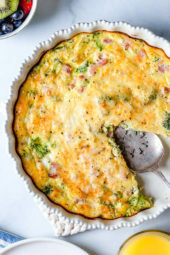 another delicious recipe that i made from this site! My favorite food ever! I love Ahi Tuna! Thanks for the recipe! Looks delicious! Spring, I recommend your local seafood store where you know you can trust the fish. Creating – so glad you liked it, I prefer arugual to spinach but to each his own! I made this for dinner tonight and featured it on my blog with my review! Next time I will be using spinach instead of arugula and leave the capers out! But other than that it was YUMMY! Love this! Looks delish. Any ideas on the best place to buy sushi grade tuna? looks delicious! thanks for the post. I didn't know that delicious food could be healthy before i came to your blog! looks hopeless for the 4th grilling, unless you have any suggestions for 4th of july grilling? I'm so glad you posted this recipe. A few weeks back I had grilled tuna at a restaurant and I've been wondering how best to cook it ever since. Every time I come to your blog, my mouth waters. I LOVE the way you cook!! This is one of my favorites! So fresh and easy! Why Just Eat – Sashimi Sushi grade tuna can be eaten raw so if you cook it, it just needs to sear quickly on both sides. One minute on each side and it's done, it won't be overcooked whether you cook it on the grill or a hot pan. To be totally honest, the only kind of tuna I'm not afraid to cook is the kind that comes in a can. 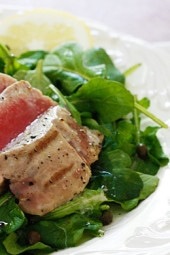 I'm always so afraid I'll over cook (or under cook) ahi tuna! Any tricks? Do I have to worry about food poisoning if it is under cooked? I just recently found your website and I LOVE IT!! All your recipes look so good and I love that you focus on using real food! I am going to try two recipes this week and I hope they will boost my weight loss goals. Thanks so much for this awesome site! Oh yes, this is completely my kind of meal!